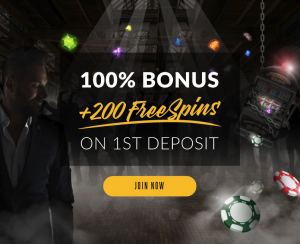 One of the newest casinos to hit the industry with its dark side, ShadowBet, a refreshing approach from a much needed casino online to give the industry a kick up the backside. In our review of ShadowBet, we will look at how ShadowBet has delivered their own unique take to ‘casino’. You’ll learn about the games lurking in the ShadowBet lobby, the casino’s software, ShadowBet services and payments. You will also know more about the ShadowBet promotions and we end with our verdict, is it the best casino online? Let’s now step into the shadows of ShadowBet. The ShadowBet arsenal of games come categorised as slots, jackpots, tables and live. You will also find a selection of other game which tailors for the niche players, such as bingo and instant win games. The main games come from the developer minds of Evolution Gaming, Microgaming, NetEnt, NYX, Play’n GO, Quickspin, Red Tiger, SG Interactive and Yggdrasil respectably. The ShadowBet titles include from this the massive progressive jackpots Mega Moolah™ and Divine Fortune™. As for the live gaming option, you have 24 tables to play on with ShadowBet live dealers ranging from roulette and blackjack to baccarat. ShadowBet is accessible across all devices including the service of mobile game play on Android and Apple. The Tech used by the developers integrates HTML5 software so it can be uploaded instantly without needing to install a Flash player. The protection networks is looked after by SSL digital encryption so your personal details and banking data is uniquely stored and safe. Should you be making any deposits at ShadowBet or withdrawals from wins you pick up then the following payment methods are suited to your needs. Without them, you won’t be able to sign up to ShadowBet. Visa, Neteller, Paysafecard, Trustly, Skrill, EcoPayz and Euteller. The website of ShadowBet is supported by SSL digital encryption, safe and secure software to keep your personal and banking details private and safe from fraud. The ShadowBet customer support team can be contacted via live chat 24/7 and email, should you need any assists with gaming, gambling queries on bets and bonuses, ShadowBet also have skills in the technical department. 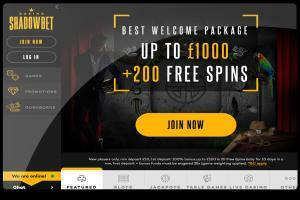 Currently, ShadowBet is offering a 100% welcome bonus which includes 200 free spins. This offer is only available to new members looking to deposit their interest in a membership. Aside from the welcome bonus, you have a selection of promotions which runs throughout your time in ShadowBet. Every Tuesday at ShadowBet you have a roulette or blackjack offer that you literally cannot lose on, Wednesday is ShadowBet Happy Hour time with 10 free spins for everyone! There is more inside ShadowBet which we shall leave as a surprise. ShadowBet brings in great bonuses to new and existing members. They also provide a different gambling option with their in-house game that was bespoke made for members only. This is the surprise we won’t tell you about. The site is like nothing else out there, with a sleek yet edgy style which suits their brand. Most go over the top in their approach, this is the reverse but excellently executed. ShadowBet features all the biggest games and is an experience from the first moment you join and easily ups other providers to shame. ShadowBet is licensed and regulated with gambling commission approval for fair play. The ShadowBet banking options come with a withdrawal time of 3-5 working days. The bottom line is, is that there is extra cash to be won at ShadowBet, it’s fun with popular live casino games and jackpot slots that everyone should be playing. Check the ShadowBet site out for yourself and pick up a very good welcome bonus.